As part of the Royal Tour of the Middle East, HRH The Prince of Wales presented the prizes to the winning school team at the Finals of the INJAZ-Mosaic Enterprise Challenge held in Amman, Jordan on Wednesday 13th March. The Enterprise Challenge was delivered by Jordanian charity INJAZ, supported by Mosaic. The UK’s Foreign & Commonwealth Office’s Arab Partnership Fund funded Mosaic, an initiative of Business in the Community which was founded by His Royal Highness in 2007, to deliver the Enterprise Challenge in Jordan. Mosaic is working with a local partner organisation called INJAZ, a charity of which Her Majesty Queen Rania is Royal Patron. Combining INJAZ’s existing successful programmes with Mosaic’s expertise in delivery of the Challenge has provided an excellent opportunity to support young people in Jordan to understand and flourish in business. Over 1200 school students have participated in the Jordan competition, exceeding all targets, providing the value of the programme and its relevance to Jordan’s social needs. 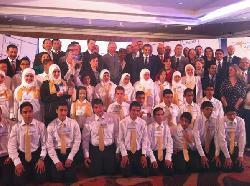 The Finals brought together the six highest performing schools in Jordan together for a final competition. As well as the 36 finalist students, the event was attended by business mentors to support them and an audience of 100 people, made up of parents, teachers and representatives of Jordan-based business. The school teams competed using the online game and also making business pitches. His Royal Highness attended the event to award the final prizes. The Apax-Mosaic Enterprise Challenge is a national UK competition that aims to inspire knowledge and enthusiasm about business amongst young people. School teams, supported by volunteer business mentors, compete online through a business simulation game. This game encourages students to demonstrate how key components of business such as finance, sales, marketing and production come together to determine success. Teams also consider what it means to be a responsible business. His Royal Highness The Prince of Wales attended the Enterprise Challenge Finals in the UK in March 2013. Mosaic designed the Enterprise Challenge in 2008 and this year’s UK Challenge has involved 3000 students across 85 schools in the UK. This is the first time, however, that the Challenge has been delivered to school students outside of the UK. The UK Enterprise Challenge Finals take place on 21st March in London, with Special Guest sb.tv young entrepreneur Jamal Edwards.